Background: hepatotoxicity due to herbal remedies is being increasingly recognized. Centella asiatica (Centella asiatica Linn Urban) is commercialized for multiple conditions. Its active principles are pentacyclic triterpenic saponosides (asiaticoside, madecassoside). Clinical case studies: we present three women (61, 52 and 49 years old) who developed jaundice after taking Centella asiatica for 30, 20 and 60 days. 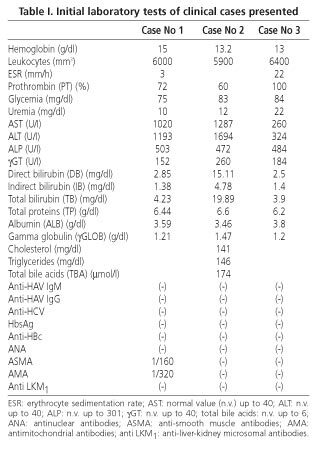 Respective laboratory tests: ALT: 1193, 1694 and 324 U/L; ALP: 503, 472 and 484 U/L; bilirubin: 4.23, 19.89 and 3.9 mg/dl. The first patient also had ASMA 1/160 and AMA 1/320. Respective pathological diagnoses: granulomatous hepatitis with marked necrosis and apoptosis; chronic hepatitis with cirrhotic transformation and intense necroinflammatory activity, and granulomatous hepatitis. All patients improved with Centella asiatica discontinuation, and ursodeoxycholic acid 10 mg/kg/day. The first patient took Centella asiatica again, with recurrence of the damage. The second one had taken this herb a year before. Conclusions: many plants synthesize hepatotoxic compounds. Germander, Skullcap and Glycyrrhizin contain di- or triterpenic active principles, which can produce hepatic injury by promoting apoptosis and altering cell membranes. We hypothesize that these mechanisms may have resulted in injuries associated with Centella asiatica. The presence of autoantibodies and granulomas also favors an immune-mediated mechanism. Ursodeoxycholic acid has anti-apoptotic properties, but we cannot rule out that Centella asiatica discontinuation alone may have resulted in patient improvement. Key words: Hepatotoxicity. Centella asiatica. Apoptosis. Ursodeoxycholic acid. Jorge OA, Jorge AD. Hepatotoxicity associated with the ingestion of Centella asiatica. Rev Esp Enferm Dig 2005; 97: 115-124. Hepatotoxicity associated with herbal remedies is being increasingly recognized (1,2). In recent years the use of these substances has increased in the Western world (3,4). These herbs are considered healthy with no association with toxic effects (5). The liver, responsible for their metabolism, is susceptible to damage by these herbal remedies (6). Many plants come from the East, where they have been a part of traditional medicine in countries such as China and Japan (7,8). Although these substances are perceived as relatively safe, about 1% of the people who use them may develop elevated hepatic enzymes (9). The most widely known compounds related to hepatic lesions are Ma-Huang (10,11), Jin-Bu-Huan (12,13), and Syo-Saiko-To (14). They have been involved in lesions such as hepatocellular damage, autoimmune hepatitis, fulminant hepatitis, chronic hepatitis, and cirrhosis. The herb Centella asiatica (Centella asiatica Linn Urban) comes from the Eastern world, especially India and Sri Lanka. For thousands of years it has been used in Ayurvedic medicine (15) to treat wound healing and leprosy, and as a psycho-physical regenerator and blood purifier (16-18). Plants and extracts of this herb have active principles, namely pentacyclic triterpenic saponosides: mainly asiaticoside (ester of asiatic acid and a trisaccharide) and madecassoside (ester of madecassic acid and a trisaccharide). Other minor saponins are centelloside, brahmoside, brahminoside, and centellasaponins B, C and D (19-21). At present Centella asiatica is used for dementias and cognitive disorders (22,23), in the treatment of chronic venous insufficiency, diabetic microangiopathy and atherosclerotic plaques (24,25), and in dermatological pathologies such as wound healing and scars (26), prevention of striae gravidarum (27), and psoriasis (28). It is commercialized for the treatment of obesity and cellulitis (19). The use of Centella asiatica may be seemingly associated with the development of adverse effects such as contact dermatitis (related to active principles such as madecassoside) (29-31) and infertility (related to isothankuniside and thankuniside, which are present in extracts) (32). We have found no cases of hepatotoxicity associated with the ingestion of this herbal medicine in the literature. We discuss three clinical case studies of hepatotoxicity related to the ingestion of Centella asiatica. Case 1. A female, 61-year old patient with no medical history. She consulted for pain in the right hypochondrium, choluria, jaundice, asthenia, and generalized arthralgia. She had been ingesting tablets of Centella asiatica for 30 days to lose weight. At physical examination, she showed jaundice and painful hepatomegaly. Laboratory tests (Table I): AST, 1020 U/L; ALT, 1193 U/L; alkaline phosphatase, 503 U/L; total bilirubin (TB), 4.23 mg/dl. ASMA, 1/160; AMA, 1/320. Abdominal ultrasound was normal. Hepatic biopsy: granulomatous acute hepatitis, with marked cellular necrosis and apoptosis (eosinophilic degeneration), mainly in zone 3, accompanied by lymphoplasmocytic infiltrate (Figs. 1 and 2). She was administered ursodeoxycholic acid (UDCA) 10 mg/kg/day, and evolved favorably. Two months later she was asymptomatic and anicteric. Laboratory tests: AST, 23 U/L; ALT, 18 U/L; alkaline phosphatase, 191 U/L; γGT, 43 U/L; TB, 1.18 mg/dl; prothrombin activity, 100%; ASMA (-); AMA (-). UDCA was discontinued, with a persisting good clinical and laboratory evolution. Seven months later, she took Centella asiatica again for 2 weeks. She presented with pain in the right hypochondrium, jaundice and asthenia. Laboratory tests: prothrombin activity, 72%; AST, 413 U/L; ALT, 481 U/L; alkaline phosphatase, 383 U/L; γGT, 68 U/L; TB, 2.8 mg/dl. Negative viral serology. Negative ANA, ASMA, and AMA. Hepatic biopsy: similar lesions to those shown in the previous biopsy (Fig. 3). She was treated with prednisone at decreasing doses, starting with 40 mg/day, and UCDA 10 mg/kg/day. One month later she was asymptomatic and anicteric. Laboratory tests: prothrombin activity, 90%; AST, 16 U/L; ALT, 27 U/L; alkaline phosphatase, 238 U/L; γGT, 25 U/L; TB, 0.6 mg/dl. Medication was discontinued, with good clinical and laboratory evolution during follow-up for over 8 years. ASMA and AMA remained negative. Case 2. A 52-year-old female patient who consulted for asthenia and anorexia followed by pruritus, choluria, acholia, and jaundice. At physical examination she showed jaundice and painful hepatomegaly of augmented consistency. She said she had ingested Centella asiatica tablets for three weeks to lose weight. She reported a similar history one year before, accompanied by elevated hepatic enzymes and a negative viral serology, when taking Centella asiatica for six months. On that occasion jaundice had disappeared one month after discontinuation of this compound. There was no history of blood transfusion, alcohol or other medication consumption, or other pathologies. Laboratory tests (Table I): prothrombin activity, 60%; AST, 1287 U/I; ALT, 1694 U/L; alkaline phosphatase, 472 U/L; TB, 19.89 mg/dl; TBA: 174 μmol/l. Abdominal ultrasound: normal. Hepatic biopsy: chronic hepatitis with cirrhotic transformation, with cholestasis and intense necroinflammatory activity accompanied by granulomas and areas of necrosis and eosinophilic degeneration (Figs. 4 and 5). She was administered UDCA 10 mg/kg/day and evolved favorably. Two months later she was asymptomatic and anicteric. Laboratory tests: prothrombin activity, 100%; AST: 32 U/L; ALT, 40 U/L; alkaline phosphatase, 221 U/L; γGT, 30 U/L; TB, 1 mg/dl; TBA, 1.82 μmol. Evolution was good, with the patient remaining asymptomatic and without elevated liver enzymes during follow-up for more than five years. Case 3. A 49-year-old female patient with no medical history. She consulted for pain in the right hypochondrium, jaundice and asthenia. She had ingested Centella asiatica tablets for 2 months in order to lose weight. At physical examination she showed jaundice and painful hepatomegaly. Laboratory tests (Table I): AST, 260 U/L; ALT, 324 U/L; alkaline phosphatase, 484 U/L; TB, 3.9 mg/dl. Abdominal ultrasound: normal. Hepatic biopsy: granulomatous hepatitis with areas of necrosis and eosinophilic degeneration in zone 3, accompanied by lymphoplasmocytic infiltrate. She was administered UDCA 10 mg/kg/day, and evolved favorably. One month later she was asymptomatic and anicteric. Laboratory tests: AST, 24 U/I; ALT, 33 U/L; alkaline phosphatase, 263 U/L; γGT, 39 U/L, TB, 0.8 mg/dl; prothrombin activity, 100%. UDCA was discontinued, and a good clinical and laboratory evolution ensued during follow-up for one year. Herbal remedies may give rise to toxicity in different tissues (33). Many plants synthesize alkaloids and cyclic compounds to prevent animals from eating them (34). The liver metabolizes these substances through cytochrome P450. During biotransformation, metabolites are produced which react with macromolecules and damage hepatic cells or generate neoantigens, which trigger immune damage (35). Terpenes are cyclic hydrocarbons constituted by isoprene units. They are distributed in the vegetable kingdom in the form of oxygenated derivatives (alcohols, aldehydes, carboxyl acids, esters) (36,37). Triterpenic saponosides are heterosides (formed by a carbohydrate and a non-glycosid group or aglycone) which can be toxic for animals (38). They alter cell membranes by interacting with their lipid layer and through their anti-ATPase power, thus disturbing sodium transport (39,40). Glycyrrhizin is a triterpenic saponoside present in herbal remedies like Syo-Saiko-To, which are associated with hepatotoxicity. 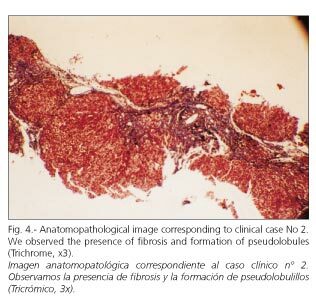 The most characteristic lesions have been centrilobular necrosis and fibrosis in cases of prolonged consumption (14). Germander (Teucrium chamaedrys) is a herb whose active principles are furane-neo-clerodane-diterpenoids. These are metabolized by CYP3A to reactive metabolites, which covalently bind to proteins and reduce intracellular concentrations of glutathione (GSH). This increases calcium concentration, and transglutaminase is activated to form aggregates with cytoskeleton proteins. Increased calcium activates endonucleases, which fragment nuclear DNA and favor apoptosis (41,42). Skullcap (Scutellaria Lateriflora) has neo-clerodane-diterpenoid active principles like scutelaterins A, B, and C. These are metabolized to reactive compounds by CYP3A. They induce intracellular GSH depletion, calcium increase, and activation of transglutaminases and endonucleases. They favor mitochondrial permeability transition pore (MPTP) opening at the inner membrane and the rupture of the outer membrane, thus releasing cytochrome c into the cytoplasm, activating caspases, and originating apoptosis (43). Camphor contains cyclic terpenes associated with hepatotoxicity (44). The active principles of Centella asiatica (asiaticoside, madecassoside) are triterpenic compounds belonging in the same family of vegetal hydrocarbons as the diterpenes in Germander and Skullcap, the glycyrrhizin triterpenic saponoside, and the cyclic terpenes of Camphor. We hypothesize that damage produced by Centella asiatica probably takes place through a similar mechanism to that of these herbs, with induction of apoptosis and death through an alteration of cell membranes. In this respect, the liver biopsies of our patients showed marked eosinophilic degeneration and cellular necrosis. The etiological diagnosis of hepatotoxicity from herbal remedies and medications is based on clinical and chronological circumstantial evidences (45). The gold standard is response to the re-administration of the chemical compound, which is called rechallenge. This must be produced in accidental circumstances, since it may be dangerous, especially when an immune mechanism is suspected. When positive (hepatic lesions develop again), this diagnosis may be suggested (46). 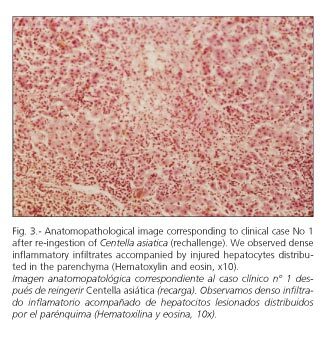 In cases discussed here, we observed a clinical and chronological sequence between consumption of Centella asiatica and the development of hepatic lesions. Moreover, in cases 1 and 2 unintentional rechallenge was positive. The histopathological alterations that accompany hepatotoxicity from herbal remedies or medications have been classified according to the predominant type of lesion (47). One of the most frequent forms is acute hepatocellular injury with marked necrosis of hepatocytes and apoptosis, generally more intense in zones 2 and 3. It may be accompanied by an inflammatory infiltrate surrounding injured cells. There is a considerable increase of transaminases with respect to alkaline phosphatase. This may be related to mechanisms of dose-dependent, idiosyncratic or immunological toxicity. The chronic form is less frequent; it is associated with a more prolonged consumption of the substance, and is responsible for about 1% of chronic hepatitis and cirrhosis (48,49). In cases 1 and 3 the predominant lesion was of an acute hepatocellular type. 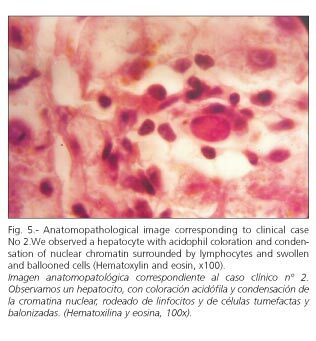 The presence of granulomas and autoantibodies (ASMA and AMA) in case 1, and the relatively short time between re-ingestion of the substance and the development of symptoms in cases 1 and 2, favor the possibility of an immune mechanism as a component of hepatotoxicity. These mechanisms have been involved as part of the etiology of hepatotoxicity from Germander (50) and herbs containing Skullcap and Glycyrrhizin, such as Syo-Saiko-To (51). 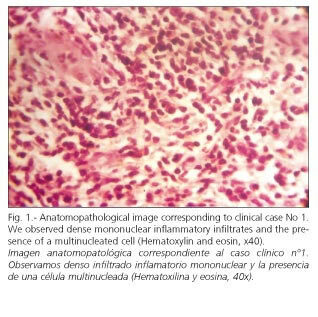 In these cases were also observed the presence of autoantibodies and granulomas. In case 2 (where there had been a more prolonged previous consumption of Centella asiatica) we also observed a chronic hepatic injury associated with cholestasis. Undefined environmental factors and an individual susceptibility associated with metabolic idiosyncracy (which in cases of hepatotoxicity from chlorpromazine, phenytoin, and Kava has been related to genetic defects in hepatic metabolism) may predispose to the development of hepatic lesions when ingesting herbal remedies (52,53). The treatment of hepatotoxicity due to herbal remedies consists of product discontinuation and hepatic function monitoring. In cases where hepatic insufficiency developed liver transplantation was performed (54,55). N-acetylcysteine (NAC) has been used in hepatotoxicity produced by Pennyroyal oil (56). It is a glutathione precursor, which is the main antioxidant system of hepatocytes. The active principle of Pennyroyal (pulegone monoterpene) produces depletion of glutathione, thus favoring oxidative stress and apoptosis. Ursodeoxycholic acid (UDCA) has hydrophilic and protective properties regarding membranes of hepatocytes. It is also a choleretic and immunomodulating agent, and is used in diseases associated with cholestasis (57). UDCA prevents apoptosis and hinders increased permeability of the inner mitochondrial membrane by inhibiting the opening of MPTP. It binds to the pro-apoptotic protein BAX, thus preventing its translocation towards the mitochondrial membrane, and decreases the release of cytochrome c, thus inhibiting caspase activation (58,59). The use of inhibitors of the opening of mitochondrial MPTP (like UDCA) in cases where there is apoptosis, and of glutathione precursors (like NAC and S-adenosylmethionine) in cases of oxidative stress or glutathione depletion have been suggested as therapeutic strategies in cases of hepatotoxicity (60). A beneficial effect of UDCA has been observed in hepatitis induced by amoxycillin, non-steroidal anti-inflammatory drugs, and sulfamide (61). 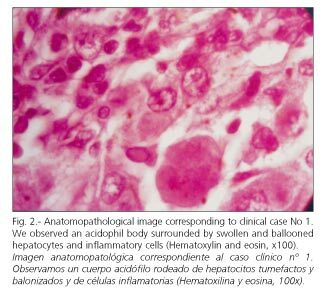 In the cases discussed here, where there was extensive apoptosis in liver biopsies, the use of UDCA was associated with clinical improvement. However, we cannot rule out the possibility that it was the discontinuation of Centella asiatica alone what brought about improvement as observed. Glucocorticoids have been used in severe hepatitis (sometimes of granulomatous type) induced by medications (62,63). They have also been used in hepatitis associated with immune phenomena produced by Kava (53), Ma-Huang (10) or Syo-Saiko-To (51). We decided to prescribe them in case 1 due to the potential severity of the histological and clinical history, and to its possible relation to immunological phenomena. In conclusion, we believe that Centella asiatica should be taken into account as a potential etiology of hepatic injury associated with apoptosis and necrosis and, in some cases, with the development of autoantibodies. UDCA, because of its anti-apoptotic mechanism, may be useful in the treatment of this condition. These findings should be confirmed by other papers.